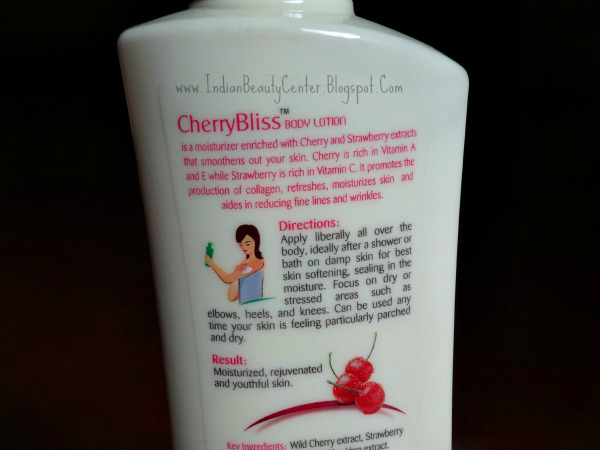 Product Claims: Cherry Bliss body lotion is a moisturizer enriched with Cherry and Strawberry extracts that smoothens out your skin. Cherry is rich in Vitamin A and E while Strawberry is rich in Vitamin C. It promises the production of collagen, refreshes, moisturizes skin and aides in reducing fine lines and wrinkles. Natural antioxidants that soften your skin. Helps maintain a healthy appearance. Very high in vitamin C that aides collagen production Reduces wrinkles along with blemishes Treats dry-skin and discoloration of the skin, Aloe Vera: Beneficial for cracked and dry skin. 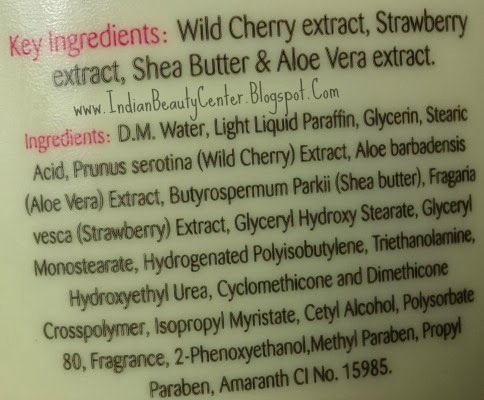 Key Ingredients- Wild Cherry Extract, Strawberry Extract, Shea Butter and Aloe Vera Extract. Directions for Use: Apply liberally all over body, ideally after a shower or bath on damp skin for sealing in the moisture. Focus on dry area or stressed areas such as elbows, heels and knees. Can be used any time your skin is feeling particularly parched and dry. Result: Moisturized, rejuvenated and youthful skin. This comes in a light yellow colored bottle with a pump to dispense the product hygienically. I loved the fact that the pump can be kept open or can be kept closed. This way, it can be taken with you on long travels too, without the fear of spillage. Now, the fragrance is medicinal cherry-like and I wish it was natural and refreshing. 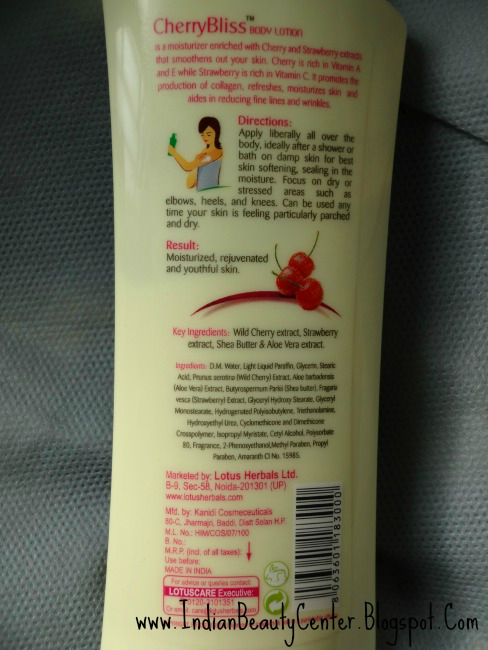 Some of you may not like the medicinal cherry fragrance.The body lotion is perfect in consistency- neither too runny nor too thick and condensed. It spreads easily onto the skin and gets absorbed in a minute. You need to properly apply some effort to get it absorbed into the skin and if you use too much of the product on one area, you may find that it becomes a bit difficult for you to get the product absorbed. You might find the packaging a bit opaque but actually, when you keep it in-front of bright light, you can see how much of the product it left behind in the bottle. Coming to the healing part now, this body lotion leaves behind no oily feeling and properly keeps the skin hydrated for about 2 hours after which you may feel the need of reapplication during winters. But, this lotion is perfect for summers. It actually heals the skin. Yes, it does, withing 2 days all the blackness on my hands and body almost disappeared and my skin felt smooth, soft and supple. So, this body lotion actually works in healing the skin. It did the same for my son and daughter- their skin became smoother and healthier. You can keep the pump open or close it for traveling too! Great, hun? this sounds good but i have extremely dry skin in winters so not for me...though looks good for summers! I have never heard of this brand but thanks for your review and sharing. Think it will be apt for summer, will give it a try. 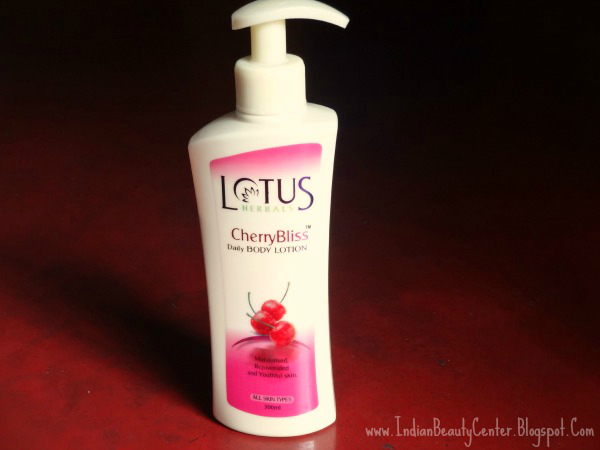 This one looks so good :) and I really love Lotus products :) so no question of skipping it ;) thanks for the review gal!